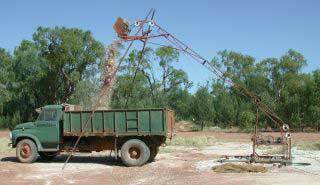 The first automatic hoist was built by Eric Cattrell at Lightning Ridge in about 1961. 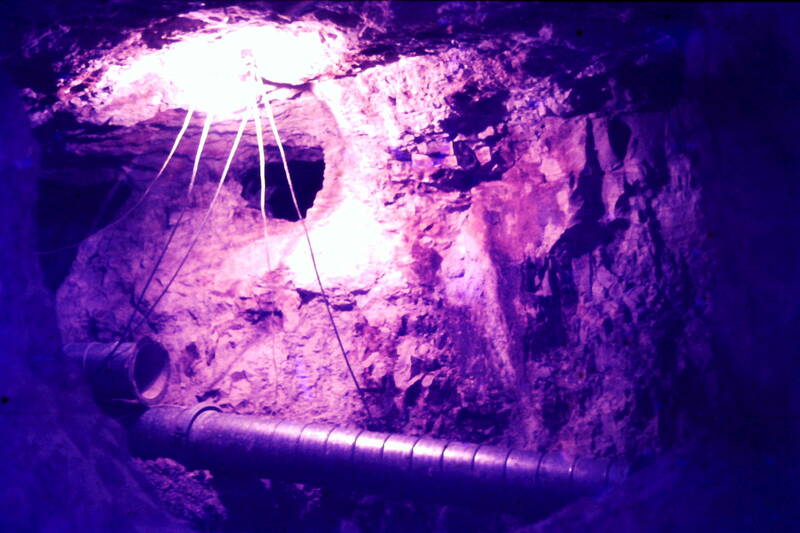 Hoists have a winch (differential or slip type drum) which is located on the surface of a mine and is used to lift a bucket of opal bearing claystone to the surface. The system is activated from underground and is completely automated. Each time the hoist is activated, the bucket travels vertically up the mine shaft using the steel access ladders as guide rails. Once at the surface the bucket then travels along a curved frame which inverts the bucket and empties the dirt on to a waiting truck or stockpile. After inversion the bucket automatically returns down the shaft to its starting position ready for an other load . The early hoist used a bucket witch was usually an old 13 gallon oil drum. In later years the same principal was used for the "super hoist" which has a hoisting bucket that can carry about 200 litres (44 gallons) of opal bearing claystone each time it is operated. 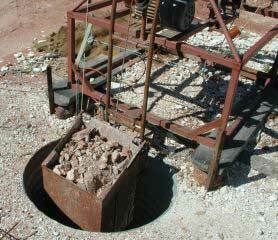 Hoist bucket loaded with opal bearing claystone, Coocoran opal fields, Lightning Ridge. Hoist tipping opal bearing claystone into the back of a truck, Coocoran opal fields, Lightning Ridge. 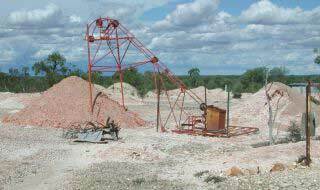 Hoist that has been used to tip opal bearing claystone directly onto the ground, Shallow 4 Mile opal field, Lightning Ridge.